Don't be fooled: there is no such thing as an historical consensus on the origins of the Great War. But there is something close to it. This happened before. Shortly after the war most historians agreed that Germany, together with Austria-Hungary, were responsible for for the outbreak of this massive world conflict. Even the famous German historian Karl Kautsky came to this conclusion when he edited the official publication of German Foreign Office documents on the origins of World War I, and later in his 1919 book Wie der Weltkrieg entstand (How the World War arose). But this view soon changed dramatically. In the 1920's historians from all over the world reached a sort of mutual agreement on a revisionist interpretation in which none of the great powers was held responsible. This interpretation held that the war was the result of a conflict between imperialist states. It was preceded by a naval race, a great increase in armaments and rivalry between world empires for control of markets. There was, it was argued, little to choose between the policies of the great powers. War broke out because everyone misjudged the consequences of the crisis created by the assassination of the Austrian Arch-Duke in Sarajevo. In this version Austria-Hungary, for its unacceptable ultimatum to Serbia, and France and Russia, for their hasty decisions to mobilize, were judged to be the powers most responsible for starting the war. Germany and Britain attempted to find a compromise but were drawn into a conflict which neither imagined would last more than a few months. In 1961 this view of the origins of the war was challenged by the German historian Fritz Fischer. To the chagrin of other German intellectuals, who preferred the theory that the other countries involved in World War I were at fault, Fischer concluded that the Germans under the Kaiser had expansionist goals in the war. Fischer argued that leading groups in Germany - including the Kaiser - sought a war which would establish German control over much of Europe. 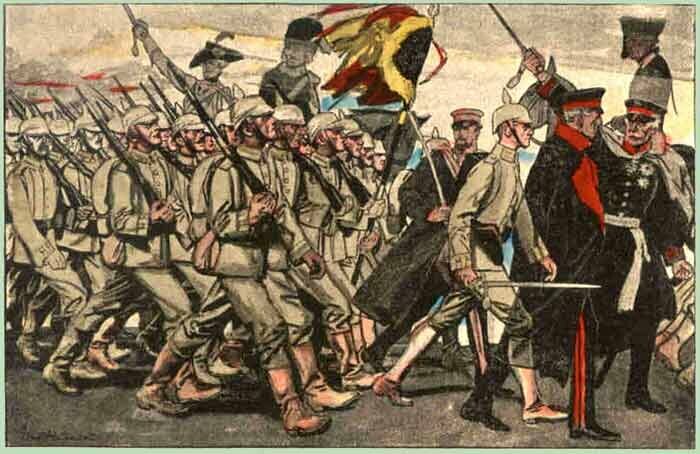 In his book "Griff nach der Weltmacht (Grab at Worldpower, translated as "Germany's Aims in World War I"), Fischer insisted that Germany deliberately encouraged the Austro-Hungarian monarchy to declare war on Serbia and actively sought war with France, hoping to repeat the victory of 1870, before dealing with Russia. Britain's small army could be ignored because the decisive engagements would be over within a few months. Fischer based his material on documents he had found in the German Democratic Republic DDR and in other archives. He had studied the so called September plans and pointed out that there was a continuancy in German war planning. Fischer soon got support. In 1964 German historian Sebastian Haffner pointed out (in his book The seven deadly sins of the German Empire in the First World War) that there had been an crucial change in German foreign policy in 1890 when the Kaiser pushed prime-minister Otto von Bismarck out of his way. Bismarck wanted to make Germany powerful, but in a peaceful way. His successors also strived for German power, but in a way that could not avoid war. Haffner explained that in the peace system of the 19th century there was a balance of power inside Europe. Outside of Europe England ruled. Bismarck never attacked this system: he just wanted to fit the new German empire into it. Bismarck's successors wanted to turn the system over and replace it by something else. They wanted a balance outside of Europe and Germany ruling inside. In 1969 Fischer published another book - Krieg der Illusionen (War of Illusions) - in which he argued that Germany systematically had aimed at war since 1912. In 1992 he threw oil on the fire with the book "Hitler was Not an Accident". His view of the origins of the Great War has not gone unchallenged. Fischer's books have been the subject of numerous discussions over the years (and they still are), with Fischer sticking to his conclusions, even as some opponents claimed he took historical quotes out of context. Fischer died in December 1999. Today most historians agree with the general outlines of the Fischer thesis. The leaders of the German Empire and of the Austrian-Hungarian Empire both were guilty. The guilt of the people of these nations exists in that they took little notice of the politics of their leaders. But then, this is a fault that these people had - and have - in common with the people of all nations. Canadian leading military historian prof. Terry Copp, adds that the 'new consensus' must seem ironic to those who lived during the First World War and are still alive today, "because it presents the origins of the war much as the people of 1914 understood them". CLick here if you want to read Barbara W. Tuchman's essay on the American entry in the Great War.